Sanjay Subrahmanyam é Professor de História da Índia na Universidade da Califórnia – Los Angeles (UCLA), ensinando, investigando e publicando sobre a história moderna da Ásia do Sul e do Índico, história da expansão europeia, história comparada dos impérios e história do mundo. Anteriormente, ensinou em Oxford (2002-04), na École des Hautes Études en Sciences Sociales (1995-2000) e na Delhi School of Economics (1983-1995), onde também obteve o seu BA, MA e PhD. O Prof. Subrahmanyam é igualmente membro dos conselhos editoriais de várias revistas nos Estados Unidos, Inglaterra e Portugal, e director-adjunto da Indian Economic and Social History Review. De entre uma vasta lista de publicações, podem citar-se os livros: Courtly encounters: translating courtliness and violence in early modern Eurasia (2012); Three Ways to be Alien: Travails and Encounters in the Early Modern World (2011); Writing the Mughal World (2011, with Muzaffar Alam); The Age of Revolutions in Global Context, c. 1760-1840 (2009, ed. with David Armitage); From Biography to History: Essays in the History of Portuguese Asia 1500-1800 (2006, ed. with Kenneth McPherson); Explorations in Connected History: From the Tagus to the Ganges (2004); Land, Politics and Trade in South Asia (2004); The Portuguese Empire in Asia, 1500-1700: A political and economic history (1993). 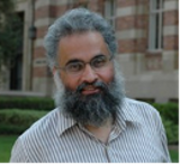 Sanjay Subrahmanyam is Professor and Doshi Chair of Indian History at UCLA, where he teaches courses on medieval and early modern South Asian and Indian Ocean history, the history of European expansion, the comparative history of early modern empires, and world history. These are also his main fields of research and publication. Formerly he had taught at the University of Oxford, the École des Hautes Études en Sciences Sociales and the Delhi School of Economics, where he received his BA, MA and PhD in Economic History (1987). Prof. Subrahmanyam is also Joint Managing Editor of the Indian Economic and Social History Review, besides serving on the boards of a number of other journals in the US, UK and Portugal. In his vast list of publications are included: Courtly encounters: translating courtliness and violence in early modern Eurasia (2012); Three Ways to be Alien: Travails and Encounters in the Early Modern World (2011); Writing the Mughal World (2011, with Muzaffar Alam); The Age of Revolutions in Global Context, c. 1760-1840 (2009, ed. with David Armitage); From Biography to History: Essays in the History of Portuguese Asia 1500-1800 (2006, ed. with Kenneth McPherson); Explorations in Connected History: From the Tagus to the Ganges (2004); Land, Politics and Trade in South Asia (2004); The Portuguese Empire in Asia, 1500-1700: A political and economic history (1993).